A typically autumnal day on Saturday 6 October greeted over 100 people who came to hear Lama Jampa Thaye give teachings on Buddhism in Bristol. 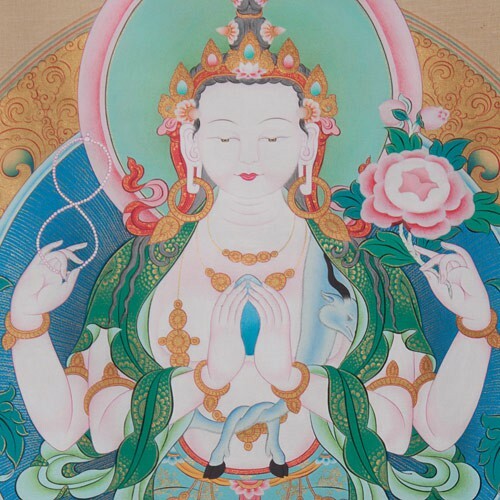 In the morning, Lama Jampa taught one of the most famous cycles of teachings in the Sakya tradition of Tibetan Buddhism entitled ‘Parting from the four attachments’. This text, explained via a short commentary by the Tibetan master Nubkyi Rigzin Drak, sets out the whole of the Buddhist path with its challenges and accompanying remedies. Lama Jampa outlined how texts such as these help us understand how the myriad teachings given by the Buddha support the development of wisdom and compassion on the journey to freedom from attachment. After this introduction, Lama Jampa went through the text, with its description of four increasingly subtle attachments and instructions on how to overcome them – from clinging to the things of this life, such as wishing for gain and wanting to avoid loss, to holding on to misunderstandings about the nature of reality itself. The afternoon continued the theme of wisdom and compassion, with the initiation of Chenrezik Mahamudra. This initiation bestows the authority to meditate on Chenrezik, the embodiment of compassionate energy, and on Mahamudra – the Great Seal – which is the true nature of mind. Sakya Buddhist Centre Bristol will welcome Lama Jampa back for more teachings in January 2019. For the full programme, take a look at the calendar here.